- Powerful nozzle also regulates less air pressure requirement. - Used for removing investment casting, oxidation and heat scale from metal. This Equipment is Very Essential For Turbocharger Authorized Service Center, Repairs and Rebuilding . It is Used for cleaning Turbine Casing, Compressor Casing, Bearing Housing, Rotor Assembly etc. Machines is Design For Less Floor Space and Compact. S-7 series represent portable blast machines based on “Pressure Blast principle. This involves pressure feed of abrasive and propelling it at high velocity against a work surface. Compressed air is used as propellant. S-7 machines are suitable for all types of abrasive(s). Prices : 6 Lakhs to 1 Cr. 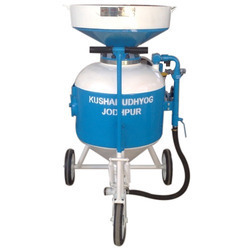 Blasting machine HR1-B is a barrel type shot blasting machine. This machine is designed for shot blast cleaning of smaller pieces, forgings, parts after heat treatment and machine parts in repair shops. Our firm is among the trusted names, involved in offering a comprehensive range of Portable Abrasive Shot Blasting Machine.